When the rights are expiring, you might as well. Sometimes, the people who own the copyright for a certain commercial product decide to rerelease said product to the general audience as a free product. Reasons for doing so vary. Sometimes, the product is not doing well, and the people who own the rights don't want the product's community to die out. Other times, it's being given out as a celebration of some event. A variation is when the product is only released for a certain amount of time before it stops being commercial. Another variation is when something becomes free only for a limited amount of time before it stops being free. May result in said product becoming either an Allegedly Free Game or Freemium. Comic book publishers sometimes reprint the first issue of an "Event" comic as a part of Free Comic Book Day. Ultimate Spider-Man, Brightest Day, a Justice League of America reboot, and Irredeemable are some of them. GiveAwayOfTheDay.com gives free software for one day only; after that it goes back to its regular price. macOS X version 10.9, known as Mavericks, became free, whereas previously new versions were paid. You have to have a Mac (or a Hackintosh) to take advantage of this, but still, it's now free and previously was not. Same with Microsoft Windows. Windows 7 and 8 owners, even if their copy is pirated, could get Windows 10 for free on launch... but they had to upgrade within a year of its release. Several Don Bluth films, including The Secret of NIMH, All Dogs Go to Heaven (along with its sequel, which wasnt directed by Bluth), Rock-A-Doodle, and The Pebble and the Penguin were legally uploaded to watch for free on Youtube Movies in 2019, albiet with ads. Both of the Happily Never After films have also been rereleased for free on Youtube Movies with ads. Igor has been made free to watch with ads on Youtube Movies as well. The first Alpha and Omega film has been released for free with ads on Youtube. TMS Entertainment uploaded their film Little Nemo: Adventures in Slumberland onto their Youtube channel to watch for free. Vudu, a video service owned by Wal Mart, offers free ad-supported movies from Metro-Goldwyn-Mayer, Warner Bros., Paramount, Lionsgate and Sony Pictures. Tubi TV offers free ad-supported movies from Metro-Goldwyn-Mayer, Warner Bros., Paramount, Lionsgate and Universal. There are a few ad-supported Lionsgate and Metro-Goldwyn-Mayer movies on YouTube. Project Gutenberg is a volunteer-based organization with the mission of promoting eBooks. People are encouraged to create eBooks of any works that have fallen within the public domain for their country. This allows them to distribute "every" book for free (where "every" means books that are no longer protected by copyright). Anathallo's first album, Luminous Luminescence in the Atlas Position, was out of print and completely impossible to buy for a period in the early 2000s. During this time, the band members would give MP3s of the album to any fan who asked them online. Havalina Rail Co.'s album Russian Lullabies went out of print, and the record label that published it went out of business. When fans clamored for a way to get the album, the band responded by putting it on their website as a free download. In August 2009, a Universal System called the D6 system was rereleased as open source under the SRD. PDF versions of a couple of books (including the base rules) were then released to the general audience for free. The company has offered many games through its Digital Distribution platform, Origin, via the "On The House" program. The service has offered many games (both classic and modern) to download and play permanently for free if they're registered within a certain (unspecified) amount of time. Titles in the promotion included (among others) Dead Space, Battlefield 3, Dragon Age: Origins, Need for Speed: Most Wanted and more. The first Command & Conquer: Red Alert was released for free as a limited-time promotion when EA released the third title in the series. Beta testers who took part in the GOG Galaxy early tests (simply signing up for the service) received a copy of the 1999 Alien vs. Predator for free to test it with. Beneath a Steel Sky was also released for free. Dungeon Keeper Gold was given away free to all users in mid-February 2014. 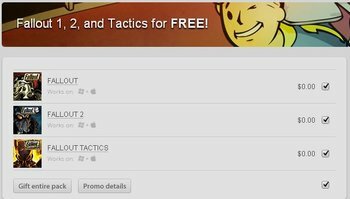 Due to their rights to the classic Fallout games lapsing, GOG offered Fallout, Fallout 2 and Fallout Tactics to all users shortly before they removed the games in late 2013 (although the rights were re-acquired a year later and the games were put back up — and priced accordingly). Users who took part in GOG surveys and system tests on two occasions in 2012 could obtain the entire Realms of Arkania trilogy for free. Flight of the Amazon Queen was released for free as well. Players who had a GOG Connect account and used it to access the service in early June 2016 could download a copy of System Shock 2 to keep permanently. Tyrian, originally published in 1995, was re-released as freeware in 2004 as a gift to everyone else. It can also be found on GOG as a freeware product. A few of the Ultima games were released for free, including Ultima 0 (a.k.a. Akalabeth: World of Doom), Ultima IV, Worlds of Ultima: The Savage Empire and its sequel, Worlds of Adventure 2: Martian Dreams. All of these can be found on GOG. Valve Software have given several of their internally-developed games away for free as part of limited-time promotions or seasonal events, as well as select games from other publishers. These deals are usually offered for a 24-hour period on Steam, and anyone who clicks "Download" on the store page keeps the games permanently. Amnesia: The Dark Descent was given out free in September 2015. The original Killing Floor was distributed for free in 2011. Left 4 Dead 2 was given away for free during the 2013 Steam Holiday Sale. Oddworld: Abe's Oddysee was distributed freely for a 24-hour period in August 2015. In late August 2016, Shadow Warrior (1997) was distributed for free for 24 hours to promote the release of Shadow Warrior 2. In late 2014, Sniper Elite V2 was offered for free for 24 hours, largely to promote the upcoming release of Sniper Elite III. Team Fortress 2 was originally a paid game (notably as part of the retail bundle The Orange Box, which included several other Valve titles), but eventually transitioned to a freemium model supported by Loot Box in 2011. According to Valve's own metrics, moving to a free-to-play model (and giving players the ability to create custom weapons, cosmetic items and hats) increased their revenue by a factor of twelve. In September 2018, Counter-Strike Global Offensive was made free like Team Fortress above, after several months of being free only to play offline and spectate matches. The catch? Servers are now segregated between "Free" and "Prime" (paid) players, and the cost of Prime Access is twice the base price of the game when it was paid. In May 2018, both Steam and the above GOG.com gave away the original Unreal over a 48-hour period to celebrate the Unreal series' 20th anniversary. Brink was permanently made free on August 2017, Steam version only, without being Freemium, although the DLC which features several new maps and features, still for sale with a price tag. Like other online multiplayer games, Age of Conan was re-released for free after its creators discovered the miracle of microtransactions. The original SimCity has been re-released under an open-source licence as "Micropolis". Both the original game and its sequel, Frontier, were re-released as free downloads from Frontier Developments, though some wrangling is needed to get them to run on modern machines. The standalone version of Elite: Dangerous' multiplayer mode, Arena, was offered for free by Steam in mid-2016. An Untitled Story and its soundtrack were originally sold for money before Matt released them as freeware. The Elder Scrolls: Arena and Daggerfall have been released as freeware. Arena on the 10th anniversary of its original release and Daggerfall on the series' 15th anniversary. Grand Theft Auto and its sequel were commercially released games. The Windows ports of the first two games were rereleased as freeware to encourage people to sign up for the Rockstar Propaganda newsletter. PlayStation Plus members get free games that usually have been around for a year or even more than ten years before. Oftentimes the new run breathes life into the online scene. Some larger games that have been offered free include Borderlands 2 and LittleBigPlanet 2. In 2009, Epic Games released UDK (Unreal Development Kit); an open-source version of Unreal Engine 3 for Windows (and later, iOS) platforms. Although anyone selling a UDK-based game still has to pay Epic royaltiesnote A one-off $99 initial licence fee and 25% of any "UDK related revenue" over $50,000, releasing free UDK based games is... free. That wasn't the first time Epic Games gave away a game for free - in 1999, they rereleased their classic fighter One Must Fall 2097 as freeware as well. In 2004, the former members of Warzone 2100's defunct developer, Pumpkin Studios, released the game and its source code under the GNU General Public License. The original The Suffering was eventually released for free, with ads embedded. The original game was originally made commercial on iOS devices. However, when it was ported to Android, the developers decided to make it ad-supported freeware. But only the Android version. The other versions are still commercial. Averted for the games released after the original, as they were available as ad-supported freeware for Android from the start. Angry Birds Rio was originally released on March 22, 2011 at the same price as the other Angry Birds games. However, on January 17, 2013, the game was rereleased for free, initially as part of Apple's "Free App of the Week" promotion. Bungie's Marathon series is now downloadable freeware, due to the computer system it was built for no longer being available. While Halo 3 is now a free download for the Xbox One, you need to have an Xbox Live account to download it. Skyroads, a shareware racer from Bluemoon Interactive, has been rereleased as freeware. God of Thunder, a puzzle-platformer by Software Creations, was rereleased as freeware in 2002. For a while, the Mektek mod group were allowed to re-release MechWarrior 4: Mercenaries as a free download with their Mekpaks. However, that has since lapsed and now it will take some searching to find copies of the game. If you can find them, Mech Commander, Mechcommander Gold, and Mechcommander 2 are all free to download—MicroProse is long gone, and the Mechcommander trilogy was made available before their sites shut down. Sega gave away a large number of their classic titles as part of the "Make Love, Not War" promotion, which was set up to publicize a sale the company was holding on Steam in early 2016. Participants who signed up each week through an associated site could get Jet Set Radio, Hell Yeah! Wrath of the Dead Rabbit, Golden Axe, Binary Domain, Condemned: Criminal Origins, Streets of Rage II, Gunstar Heroes, Viking: Battle for Asgard and Renegade Ops for free. Toys for Bob, the creators of the Star Control franchise, released the partially ported files for the 3DO port of Star Control 2 to the fans, and it was eventually finished and officially released for free as The Ur-Quan Masters for a variety of platforms here . 3D Classics: Excitebike was free to download for a limited time in June 2011 to promote the launch of the Nintendo 3DS eShop. Five Nights at Freddy's World was taken off Steam due to Scott Cawthon himself admitting that the game was unfinished and had several problems, and an updated version was later released on GameJolt . Scott even offered a refund to everyone who had bought the game at the initial Steam launch, regardless of how long they played. Microsoft temporily made Crackdown free on two occassions to promote the release of Crackdown 3. They would do likewise with Crackdown 2 when the game was added to the Xbox One's backward compatibility program. In support of the restoration effort after the Notre-Dame Cathedral fire on April 15, 2019, Ubisoft offered Assassin's Creed: Unity for free on Uplay between April 18-25, 2019. Nelvana has released much of its back catalogue for free streaming on YouTube and Tubi TV, including seasons 1-5 of The Fairly Oddparents. Studio 100 has also released its catalogue for free on YouTube and Tubi, including The Brothers Flub. All of Fat Dog Mendoza. Wildbrain and its various channels have uploaded loads of shows - both animated and live action - owned by DHX Media and its subsidiaries. The cartoons include, but are most certainly not limited to, Adventures of Sonic the Hedgehog, Robotboy, and Mona the Vampire.